See your regular doctor from the convenience of your home or office over a secure video platform. Forget about commuting to your doctor’s office — avoid traffic and save your gas money. Avoid wasting your time in crowded, uncomfortable waiting rooms. Instead, you decide where to have your doctor’s appointment. Stay engaged with your healthcare with your regular doctor. In the long run, you’ll save money on healthcare costs. Telemedicine is a secure way to see your doctor over video. See your doctor face-to-face over video and receive the same care as an in-office appointment. Telemedicine for patients is easy! Use your iPhone, iPad, Android, or any computer with a camera and microphone. Simply set up your account and join your doctor on a secure video visit. Video visits with your doctor are great for the following type of appointments and more: refilling prescriptions and adjusting medications, reviewing lab and imaging results with your doctor, discussing necessary specialist referrals, and receiving continued care for chronic conditions. Getting comfortable with video visits is key before your first appointment. Considering a video visit with your doctor? Contact their office to schedule! Why should I see my doctor on a video visit instead of in person? 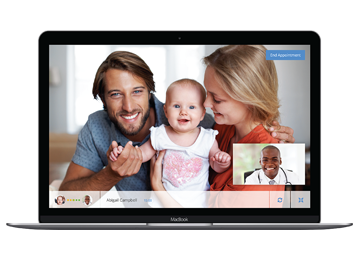 Video visits allow you to conveniently meet with your doctor over secure video. This keeps you out of the waiting room and saves you a trip to the doctor’s office. Will I receive the same quality care as an in-office appointment? For appointments that don’t require a physical examination, video visits through the Chiron Health platform are just as effective. Rest assured, your doctor will only recommend a video visit when it’s appropriate. How much will my video visit cost? These appointments are typically covered by your regular health insurance – you’ll be charged the same co-pay as an in-office visit. Alternatively, check with your doctor’s office about a self-pay option. What types of appointments are good for video visits? Most doctor appointments that do not require a physical exam are great candidates for video visits. Contact your doctor’s office to be certain and view our blog on this topic here. You will need either an iPhone or iPad, Android, or a desktop or laptop computer with a webcam and microphone. Contact your doctor’s office to request and schedule a video visit appointment, just like requesting a normal in-office visit. Looking for more resources about video visits?